Man by nature is a social animal. Friends are an absolute necessity of human life and friendship is something everyone holds dear in the world. 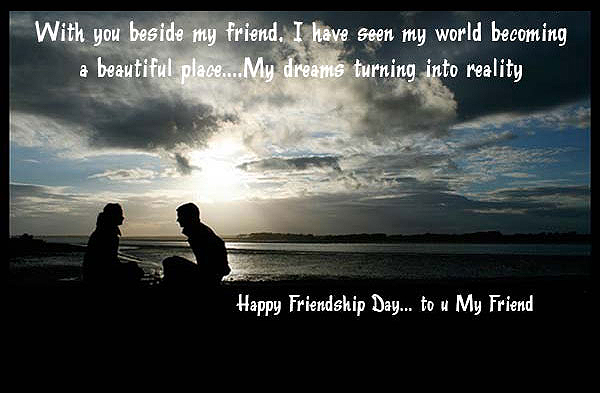 Friendship Day is the occassion to pay a tribute to that special being known as the friends. With just some days to go for Friendship Day, TheHolidaySpot brings you a beautiful flash presentation on the meaning of true friendship. Read and enjoy this fantastic flash presentation on friendship and click here to pass it on to your pals. Have an unforgettable Friendship Day celebration. Friendship is a bridge between you and me. When you are sad and lonely, cross it I'll wait on the other side forever. But if you are afraid, I'll cross it for you. Friendship is a network that needs no recharge, no roaming, no activation, no signal problems. Just make sure you don't witch off your heart. Always ask God to give you what you Deserve not what you desire ... it's because your desires may be few but you deserve a lot more! The greatest gift you can give to someone is your friendship, because you are giving them a portion of your life that you will never get back. You can't make someone love you, all you can do is be someone who can be loved, the rest is up to the person who realise your worth. Friends are like pieces of a puzzle. If you lose one it will never be complete again I just want you to know that you are one of those pieces in my life I can't afford to lose. To care without expectation is the sign of true friendship. So many of us either fear tomorrow or regret yesterday. But we have no reasons to fear or regret out past or future, for, the future will hold us together forever and it was one yesterday we met! Friendship is needless, like philosophy, like art ... It has no survival value, rather it is one of those thi8ngs that give value to survival. Those who joyfully leave everything in God's hand will eventually see God's hand in everything. Worries end when faith begins. And always remember It begins with love all. There was a heavy rain when you were born. Not because the weather was worse but the reality is that the sky was crying because he lost its most beautiful star and that's YOU. This message has no fat, no cholesterol and no additives. Only natural flavours of care and love and joy. It contains sweetness but not as sweet as you.